Chris KG6CIH and I went out roving for the first time this past weekend. It went much better than it could have, much worse than we'd hoped but much much better than expected. We're still tallying up and confirming our hand-scribbled logs, but it looks like we had around 7k points with 46 mults, in the Limited Rover category. Our stretch goal was 10k points, and our "would be nice" goal was 25 multipliers. We were short on points, but absolutely destroyed our mult goal. We learned a lot, and we've got a ton of improvements to make for next time. Our weekend didn't start so great. It was very hectic leading up to the 'test so we were wrapping up preparations until the very last minute. I finished one of our beams around 2am Saturday morning. We met early Saturday to load everything into the car to head up to Equinox VT, when we realized we had no idea how to pack the 200+lbs of equipment into my car. A mess of that later, a second realization that I had used the wrong connector on a critical power cable, and a handful of other small messes later we finally got on the road over an hour late. It was a 3 hour drive up to our FN33 site, and we didn't manage to make the site until after 3pm. We took a wild swing at setting up and finally got on the air close to 3:30, an hour and a half after the contest started. 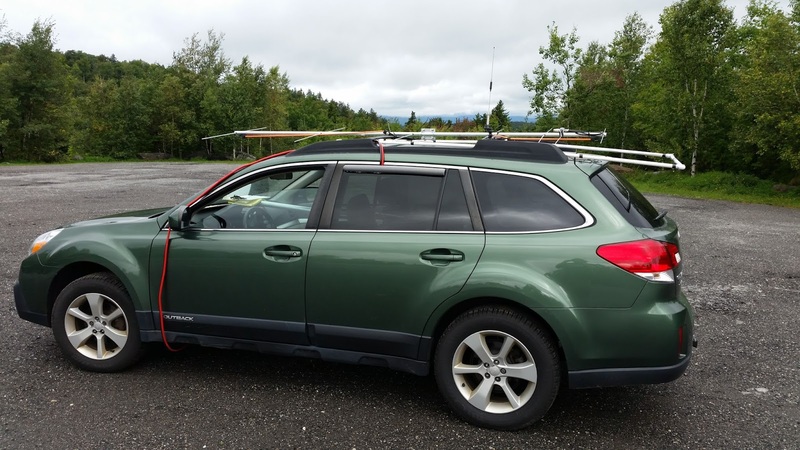 We quickly realized how awesome it was to be up a few thousand feet with beams and reasonable power on our bands, and starting pulling in contacts left and right. Unfortunately, the road up Equinox closes at 5pm - we had to break down after only about 45 minutes of operating and were being chased (slowly, and with a friendly demeanor) down the mountain by a gentleman who was dropping a massive steel gate to close the road. 2m operating station. The switch was meant for the defunct 23cm transverter and so not in use. We did fairly well up there, but had some problems. We were incredibly unorganized, and were so scattered about getting up there and going so late and so rushed that we fumbled some contacts. I know at least once I tried to call using the callsign I operated under at FD'16, and I was constantly forgetting to call CQ with "rover." I think all of my contacts included it though. We also were really terrible about handing contacts back and forth. I was running 2m, with 6, 1.25 and 70cm on Chris' station, and he was on the ground outside of the car while I was in the driver seat. It was a great site, but we certainly had some growing pains. After heading down Equinox, we headed over to our second grid, Hogback Mountain in FN32. This site wasn't quite as good as we hoped, but it was still productive. We had intended on working from directly by the edge of the mountain. Upon arriving, we realized that the parking lot along this edge was essentially a wide shoulder, on a hard curve on a steep downhill on a road heavily used by trucks. Not really wanting to get clobbered by a semi (it really takes a bite out of your final score), we moved across the street to a big parking lot. This gave us plenty of space to setup, though we had trees around us and got to smell what we later discovered was a nearly fully-decomposed black bear. Having some experience now, this operation went much better. Setup was faster and cleaner, and we were really getting into a roll running the bands with the operators we contacted. I'm pretty sure this is where we made our longest contact, FN32 to FN10. 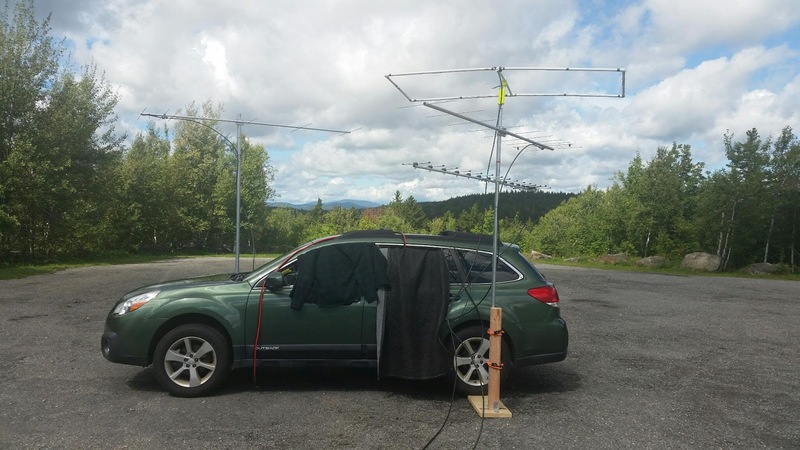 Considering our last effort was at home in a valley, it was pretty crazy that we made it from Central VT to near Harrisburg PA with 100W and 7el on 2m. We also worked guys out on Long Island, FN30. The first day netted us around 43 mults. We were sitting around 5000 points when we did some back-of-napkin (okay, cell phone) calculations at our hotel. We were VERY excited by this, and figured we'd hit at least 51 mults after we hit 2 or 3 grids on Sunday. Waking up on Sunday, we discovered some bad news. It was pouring outside, and a look at the radar and weather reports showed that pretty much every grid, site and backup site on our list had severe thunderstorm warnings until about 4pm. Mount Kearsarge, our intended Sunday AM FN43 stop, also had a road that closed at 5. We really had no desire to head up a mountain and wave a bunch of aluminum in the air during an electrical storm. After a lot of head scratching, poking around on Google, maybe some cursing, and a whole lot of sighing, we decided to return to our FN32 site at Hogback. We figured we could at least snag a few more contacts and maybe scratch out another multiplier or two. We did manage I think another 2 mults from this site in the morning. Irritatingly, while I was trying to diagnose issues with my 23cm transverter that kept us off of a fifth band for the contest, I turned the power down on my radio and forgot about it. This likely cost me a contact with W1AIM in FN34, a new mult. He was coming in strong but my puny 5W out was insufficient to make it through. As if to spite us, the weather became absolutely gorgeous. Blue skies, a bit windy, and a nice mid-70s for a temperature. A check of the radar showed that the storm had blown out to sea much faster than anticipated. We discovered this too late to get up Kearsarge, we'd have arrived after 4pm and would have barely been able to work any contacts before having to clear off. It was also really too late to head down to RI for our FN41 site, we hadn't planned to work much later than around a late dinner. We made the decision to head to my house in FN42 to at least activate the grid for our 46th multiplier. The noise floor was fairly high here, with beams nearly level with the power lines across the street from my house. Fortunately, the quietest direction happened to be aimed directly at AF1T in FN43 and we quickly and easily ran the bands with him. We had a great time time, despite getting rained out on Sunday and thus losing a number of mults and points. While we were driving, eating and during general down time we talked a lot about what we could do better (step 1: weather machine), and where we might be able to go to improve our operating location as well as make ourselves more desirable for contact. We have some plans brewing, so we'll see what comes of it. A big problem was set up time. We were running 2x 100Ah deep cycle batteries in parallel charged from the car battery/alternator. I didn't have time to get the relay/solenoid for this together, and I didn't want to leave the battery connected with the car off, so each site required the connection and disconnection of large batteries, which was a little sketchy. I also just had the batteries sitting in the back with tape over them. We used our wooden mast mounts as a wall to keep things from rolling onto the batteries. We had a lot of disorganization that would have streamlined our setup time if it were fixed. We plan to have this a little better for the next outing. 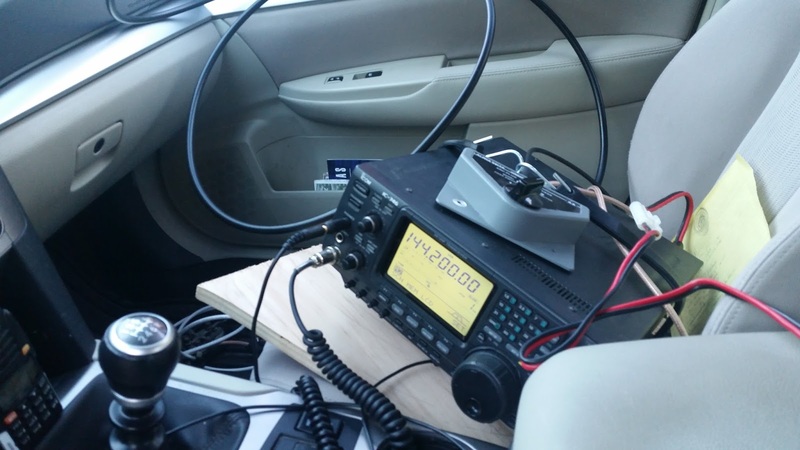 I had a 23cm transverter with me, and had intended on using it. However, if as having a heck of a time getting it to work and at one point arced the power plug to the case. I still don't know if I fried anything. I hope to get this band up next time. 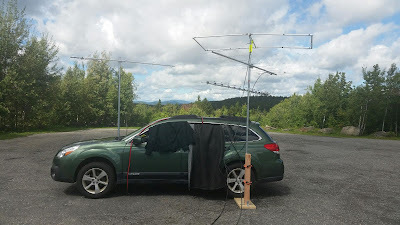 We also considered a drive by of a friend in FN42 for a 900 contact, but since we ran let of time and lost 1296 we decided to stick with limited rover and just the bottom 4 bands. Next stop: better sites, better organization, and more bands! Also, more advance testing, scouting and probably a dry run of packing and setting up. We're already planning for next time!